Okay, so we know, statistically speaking, they work well but the question is: what makes billboard advertising effective enough? The whole purpose in this choice of advertising is not to be informative, I mean we only have about 4 seconds in the drive by to take it all in, but rather to create a lasting impression of the brand. Stephen Littlejohn puts it well in his textbook on “Theories of Communication.” In chapter 7 he discusses the idea of ‘Message Reception and Processing.’ This theory implies that a communicator has 2 levels of intent: informative intention and communicative intention. Informative intention hopes that the audience is made aware of something and communicative intention being that the audience realizes the purpose of it. That is the goal with outdoor advertising. Within a matter of seconds the viewer should be visually made aware of the brand or product. Then, the advertiser has hopes that they made a big enough statement that they remember the brand, even if it is triggered in the depth of our sub-conscious somehow. What does this mean for advertising? In order to make the impression on people that they hope for, advertisers have to aim to be engaging, bold and informative all at the same time. The brands and products are resting on a visual representation…telling a story. Some of the ones seen today have accomplished just that and have been very beneficial to maintaining their brand names. For example, the creative “Peapod” allows those on foot to access an interactive screen when they need to complete a quick grocery shop. Shopping on the go has never been easier. The target audience for this display is those who lead busy lifestyles and don’t permit much time to complete daily necessities. This type of shopping is entertaining and even seems enjoyable. 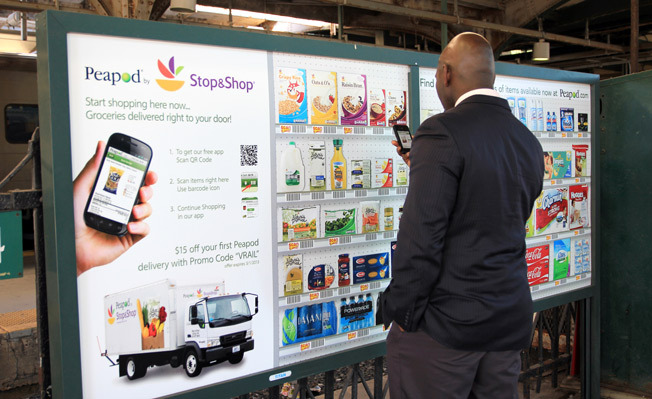 The user-friendly screen only requires a smartphone, the free ‘Peapod’ app, and a quick wave over the bar code to scan the image above it. Instant groceries are right there, only a scan away. Needless to say, advertising is making some huge improvements in their promotion of products via billboard ads. The article 40 Absolutely Brilliant Billboard Ads displays images of some of the most recently developed billboards which have been highly effective.It seems that Outdoor Advertising is finally reaching new heights in creative presentation, communicating to the public that they are something worth looking at!